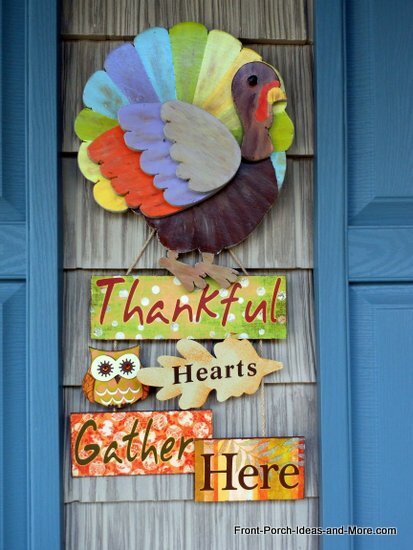 Use our Thanksgiving turkey craft idea to make your holiday a most thankful one. With Halloween a fun memory, it's time to enjoy the peacefulness of this most gracious holiday. 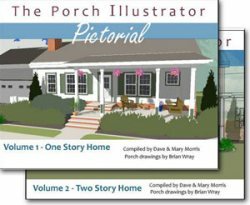 What better way than to make a turkey or a few other Thanksgiving projects to place on your front porch or in your home. 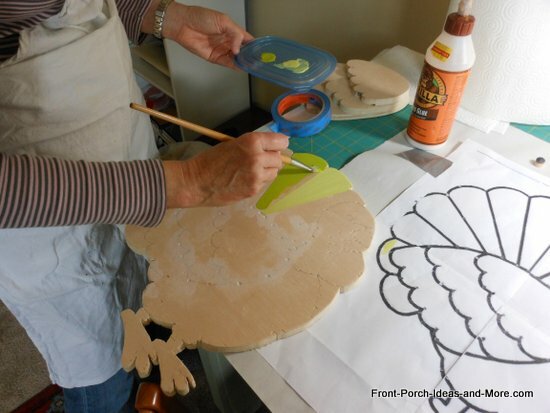 Our Thanksgiving turkey craft is relatively inexpensive and easy to make. You can probably make this holiday decoration from items you may already have on hand. Start with our Thanksgiving turkey project that's sure to delight both young and old and then check out several other decoration ideas for Thanksgiving below. 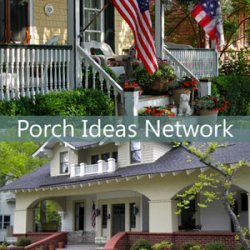 What's neat about this project is you can hang it on our autumn pumpkin fence (also a neat Thanksgiving project too - see our plans) or on your porch wall, or use it indoors as well. Let's get started! 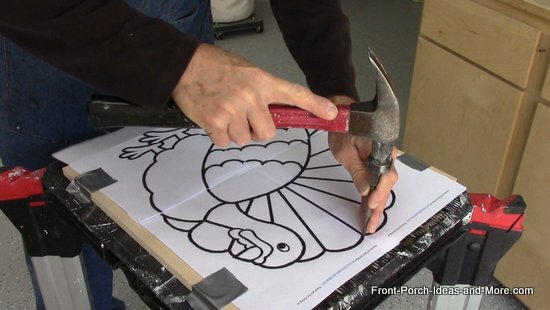 Watch our turkey video to see the process and use the steps outlined below to make your own Tom Turkey. 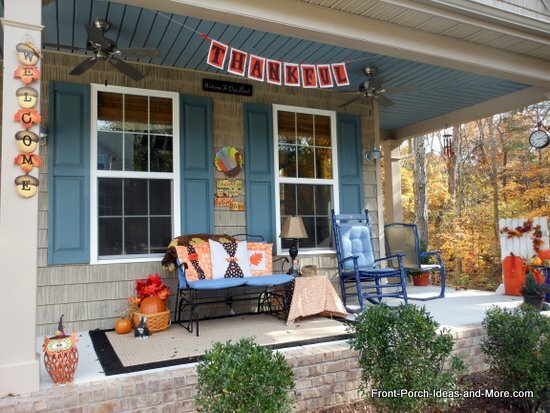 Then see how you can make more of our other decoration ideas for Thanksgiving below. 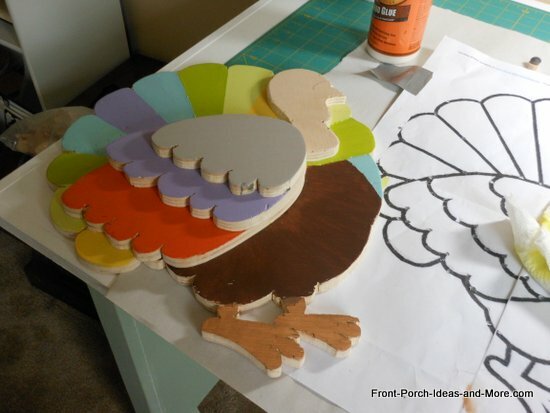 Watch us make this adorable turkey craft - thank you! 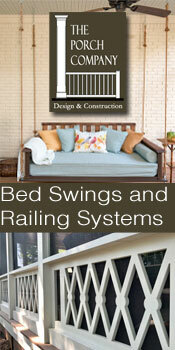 This project only requires a few tools along with some craft paints and a brush. 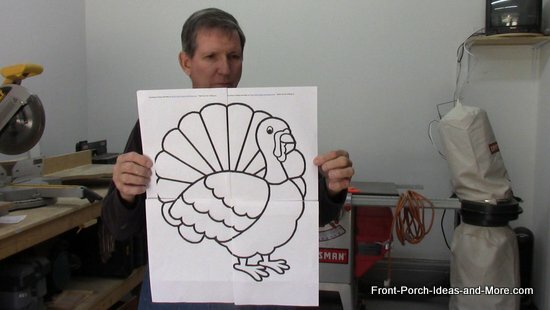 Download a free turkey template. Because of its size you will need to tape the four sections together to form the entire template. Lay the template on the plywood making sure the turkey will fit appropriately. Tape the template to the plywood so it won't move. 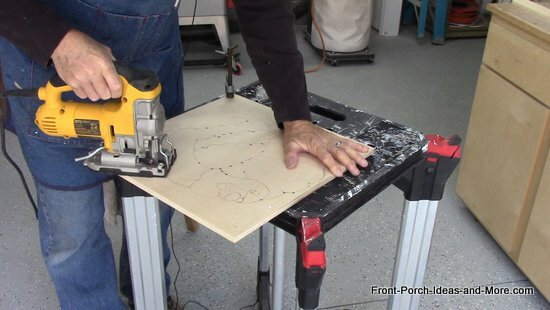 Use the nail punch to mark the plywood through the template paper. 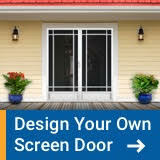 Do this by lightly tapping the punch with a hammer along the black lines of the template. Make as many marks as you need to adequately transfer the template. I lifted the template occasionally to ensure the marks were sufficient and noticed that it was easy to actually punch a hole in the plywood. Not to worry; you can easily fill the holes with caulk later in the process. NOTE: Although I don't recommend it as a general rule, you could use a Phillips screw driver as a punch. Just make sure it's not your spouse's favorite screw driver. Remove the template and connect the marks with a pencil. Refer to the template as you go to ensure your lines are correct. 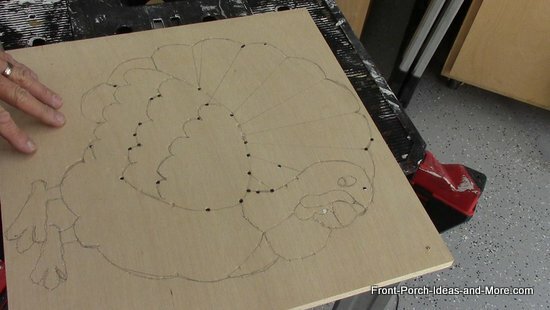 Once completed, use a jigsaw to cut out the turkey from the plywood. Use a fine tooth blade as plywood edges tear out easily. For the legs, drill a 1/4 inch hole between them and insert the blade for making those cuts. 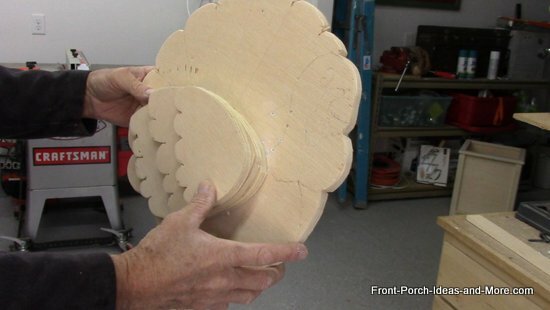 This is perhaps the most delicate cut you will make for this Thanksgiving turkey craft. 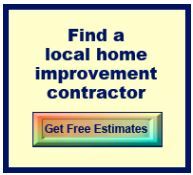 Fill any holes with caulk (painters caulk works really well for this) and sand lightly if necessary. To make your Thanksgiving turkey a bit more interesting, consider adding additional wings to give your turkey more depth. Use the template to mark and cut wings as shown. You will glue them onto the turkey later. You could do the same with the head - as you will see we did. 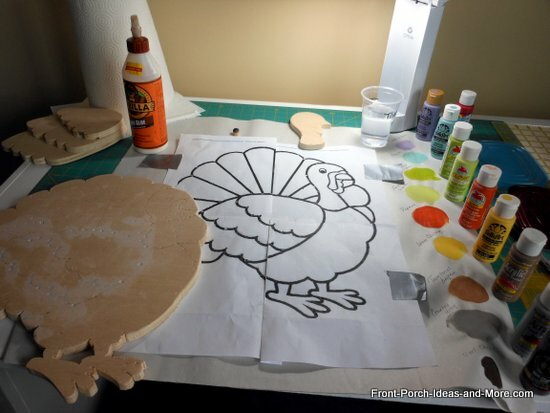 Now is the time to make your turkey come alive with paint! 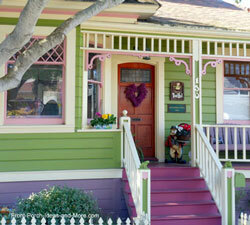 Mary has an eye for color and selected a specific color scheme, in this case, a soft palette. You might want to consider painting your turkey in colors that complement your own decor or go crazy with bright vibrant colors. Glue the extra wings and/or head to the body if you are using additional ones. I used wood buttons (available at craft stores) to make the eye and glued it onto the turkey. After painting, Mary brushed on just a little brown paint here and there for a vintage look. After the glue dries you may want to cover your turkey with polyurethane to protect it from the elements if placing him outdoors. 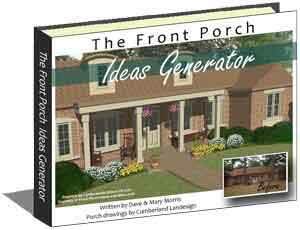 I recommend you cover the front, back, and edges. 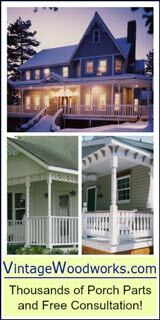 Polyurethane won't be necessary if using indoors. If using as a wall decoration attach a wire to the back of the turkey. We combined ours with a Thanksgiving message (photo below). 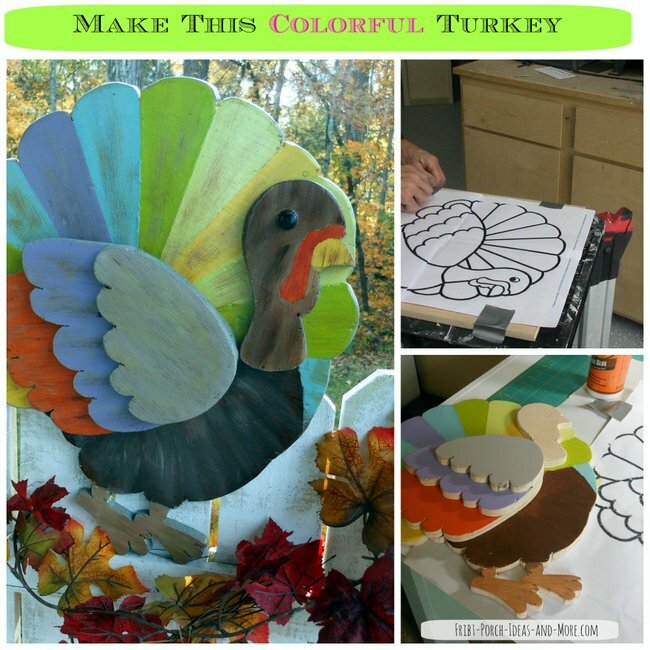 This is a fun Thanksgiving turkey craft and pretty easy to do. 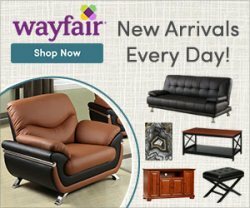 Make an extra turkey and give it away as a gift! 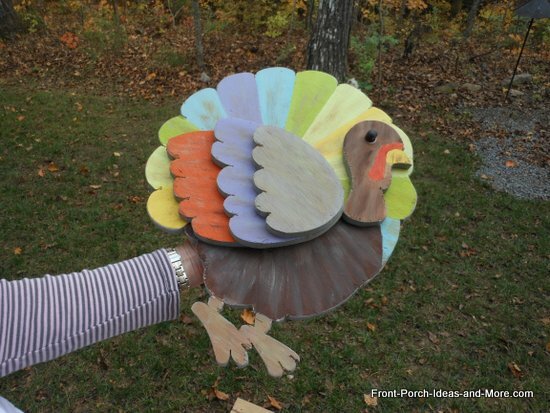 We encourage you to check out our other Thanksgiving craft ideas too. 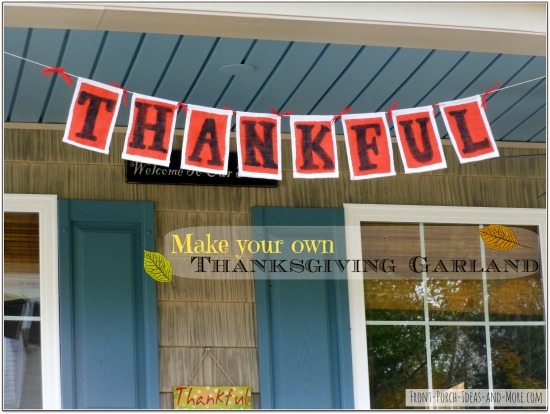 Make a no-sew Thanksgiving garland like the one below. 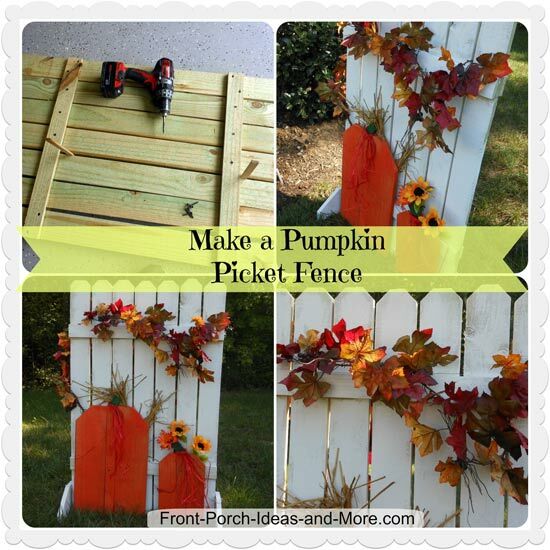 Make this autumn pumpkin fence and use it all year! We added a black cat for Halloween and plan to replace the pumpkins with a Christmas tree and mailbox for the holidays (check back for the plans).